This takes about 10 minutes to prepare and makes a wonderful appetizer. You can use either fried or roasted peanuts: both are delicious, differing mainly in the mouthfeel of the moist or crunchy nuts. Reprinted from Every Grain of Rice: Simple Chinese Home Cooking*by Fuchsia Dunlop. Copyright © 2012 by Fuchsia Dunlop. Photographs copyright © 2012 by Chris Terry. With the permission of the publisher, W.W. Norton & Company. All rights reserved. Cut the tofu into 3/8-inch cubes. De-string the celery stalks, cut them lengthways into 3/8-inch strips, then into small pieces to match the tofu. 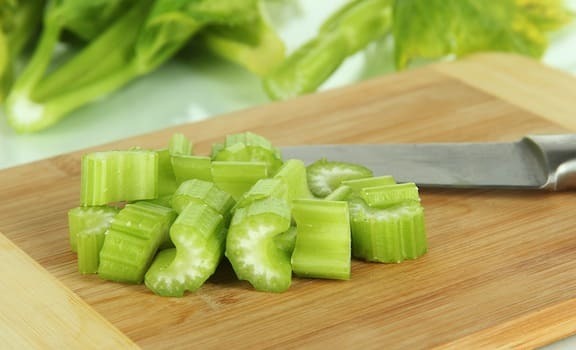 Bring some water to a boil in a saucepan, add the celery and blanch for 30 to60 seconds; it should remain a little crunchy. Remove to a colander and cool immediately under the cold tap, then shake dry. Combine all the ingredients in a bowl and mix well. Serve. Roasted or fried peanuts may be used in cold-dressed dishes and also in a few hot dishes. 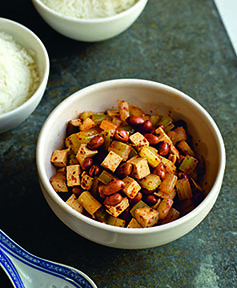 Fried peanuts make a delicious nibble in their own right, perhaps sprinkled with salt and ground roasted Sichuan pepper. Both fried and roasted peanuts should be stored in an airtight jar if you don’t intend to eat them immediately. They are most delicious when freshly fried or roasted. To roast peanuts, heat an oven to 120°C/250°F/gas mark 1/2. Place the raw nuts on an oven tray and roast for 15–20 minutes, until fragrant and very slightly golden. Do keep an eye on them, as they are easily burned. If you are not sure if they are ready, remove one peanut, allow to cool slightly, then taste: when done, it will have lost its raw crunchy flavor and have a dry, aromatic crispness. When the nuts are cooked, remove them from the oven and tip on to a plate to cool down. Rub the cooled nuts between your fingertips to loosen the skins. Then stand in the garden or on a balcony and shake the nuts as you blow over them: the skins will blow away. To fry peanuts, heat enough oil to cover the raw nuts in a wok over a gentle flame to 250°F (120°C), adding the peanuts as it starts to warm up. Fry them for about 20 minutes, stirring often and taking care not to burn them. When they are crisp and fragrant, remove them with a slotted spoon or strainer, drain well and spread out to cool completely. Thanks, Stephi — I agree!